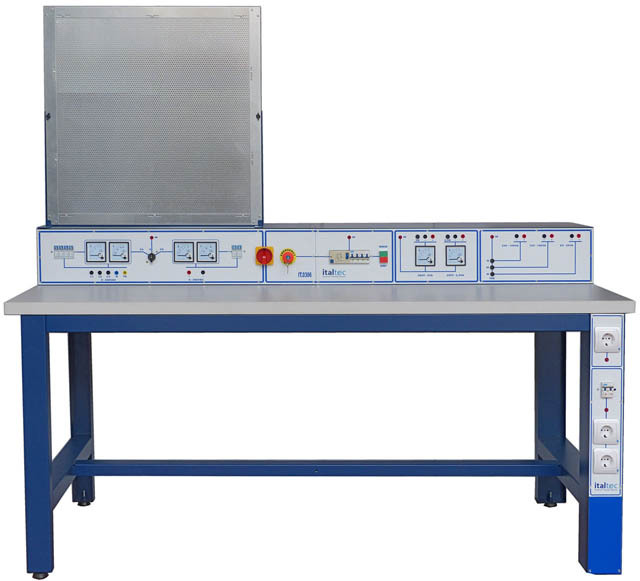 Complete power panels for laboratories of electrotechnics and electronics, for testing of all electrical machines. Pulpits with single-phase, three-phase and direct current supply. Possibility of voltage variation for all needs, complete set of tools for measuring, extensive safety equipment. Desks with benches for electrical measurements and laboratory tests on electrical machines, manufactured according to the safety rules for laboratories, ready to be plugged into the mains. They consist of a basic bench + table built with wooden double laminate with rounded corners. Size cm 100x35x35. It is possible to allocate one central pulpit, or two, side by side, or a pulpit on the minor side of 100 cm, to allow the collective work of 4-5 students. The electric charachteristics can be choosen according the differents codes among MOD.0000 and MOD.9000. All desk are complete of emergency mushroom and switch with consent key to ensure the maximum security level. In addition to standard solutions, other desk can be realised on request. 1 Emergency Mushroom Allows the arrest ofonly one bench without disturbing the others. A pilot lamp show the voltage presence. 4 3 phase variable output Variable auto transformer with over charge and short circuit protection. General Three Phase Magneto Thermal Switch. Current 2A to 20A, according to the codes. 11 Single Phase 0-250V variable single phase protected by a 2-poles magneto thermal automatic switch (11). Output indication on 1 voltmetre and one ammeter analogues or digital. Output indication on 1 voltmetre and 1 ammeter analogue or digital. Protected against over charge and short circuits by means of magneto thermal tripolaire (9A). 9b Single Phase output 230V Protected against over charge and short circuits by means of magneto thermal tripolaire (9B). 12 Security Key Switch On-Off, to ensure the start-up with memory function for high security. A warning light indicates the presence of voltage. 13 Voltmeter and Ammeter Voltmeter and Ammeter analogues or digital according to custom preferences. Made of metal cabinet on casters, carefully treated and rust structure painted with epoxy paint. Commands and the outputs are mounted on the front panel which shows a clear screen printed synoptic with the internal circuitry. The power input is on 5-pin connector in compliance with CE regulations. Protections are realized with circuit breakers and with consensus. Emergency and fungus elcb of 30 mA are included. Three phase power supply : 400V + N + Earth. - Three-phase variable: 0-450V with voltmeter and three ammeters. - Single-phase variable: 0-250V with voltmeter and ammeter. - Variable DC output: 0-250V with voltmeter. - Single-phase variable: 0-240V with voltmeter and ammeter. - Variable DC output: 0-230V with voltmeter. Single-phase, three-phase supply and direct current . With voltage variation for ac and dc output, complete set of tools and safety equipment. Power input with 5-pin connector in compliance with CE regulations. Emergency with fungus and elcb protection of 30 mA are available on request. Three phase power supply: 380/400/415V + N + Earth. Analog or digital instruments on request. Protection on input with magneto-thermic and with fuses on output. 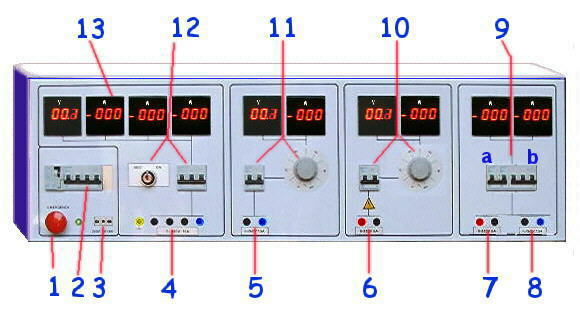 -1-Three-phase and mono variable output: with voltmeter and ammeter. -2-Single-phase variable output: with Voltmeter and ammeter. -3-Direct current variable output: 0-250v with voltmeter and ammeter. -4-Direct current variable output: 0-230v with voltmeter and ammeter. -5-optional fixed direct current output: 220v with ammeter. -6-optional single-phase fixed output: 230v with ammeter. Two three-phase supply and two direct current supply. Possibility of voltage variation on all output, complete set of tools and safety equipment. -2-Three-phase and 1-phase variable output: with voltmeter and ammeter. Single-phase, three-phase supply direct current. Outputs with continuous voltage variation, extensive equipment of tools and safety equipment. With analog or digital instruments. Single-phase, three-phase supply with voltage variation, extensive equipment of tools and safety equipment. Single-phase, three-phase supply, direct current. Voltage variation for dc with voltmeter and ammeter. Single-phase supply, direct current. Voltage variation for dc with voltmeter and ammeter. Three-phase & Single-phase supply, direct current. Voltage variation for ac and dc with voltmeter and ammeter. Single-phase-ac and direct current, voltage variation, voltmeter and ammeter. Three-phase, Single-phase-ac and direct current(ripple<4,2%), voltage variation, voltmeter and ammeter. Three-phase input 400V, output 0-450Volt up to 8Amp. with digital multimeter. Direct current module with double output voltage 2A(ripple<4%) and 20A(ripple<12%) with voltmeters and ammeters. or send a Fax to the N. +39 02 90 720 227.